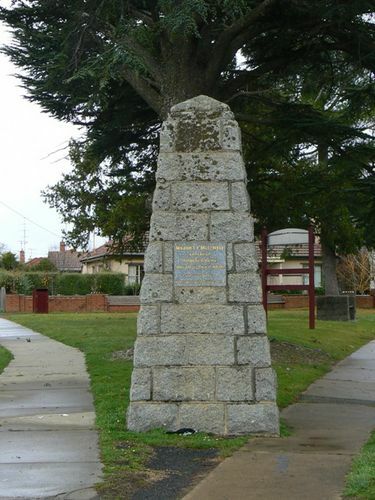 The memorial commemorates Major Mitchell`s expedition which passed through the area in 1836. KYNETON Wednesday -His Excellency the Governor (Lord Huntingfield) and Lady Huntingfield came to Kyneton today for the centenary celebrations. A number of returned soldiers under Colonel G Hurry were inspected by His Excellency. After an official welcome and presentation of address of welcome by the shire president (Councillor G J McKenna) His Excellency said that he was very grateful to see so many men and women and children to welcome. He announced that he would grant the school children a holiday to be held on Friday, and to be known as the Governors holiday. Responding to the welcome at the civic receptlon His Excellency said that he was proud to be an Australian. His heart during the 38 years he lived in England turned often to his Queensland home. After the reception Lady Huntingfield visited the Kyneton Infant Welfare Centre where she was received by the president and members of the committee. His Excellency and Lady Huntingfield also visited the Kyneton Hospital which was specially decorated for the occasion. In the presence of a large gathering His Excellency unveiled a memorial dedicated to the memory of Major Mitchell and party whose explorations in Victoria brought them to the site of Kyneton just 100 years ago. Mrs M. E Smith aged 102 years was visited by Lord and Lady Huntingfield. Argus (Melbourne), 19 November 1936.